Marsh Recreation: urban extension and lagoon restoration. The primary focus of the proposal is an urban park for the city of Murano - the concept considers a way of regenerating the ailing waters of the polluted lagoon. Over the years, the fragile nature of the lagoon has been at high risk. The marsh landscape’s natural ability to filter and recycle effectively has been limited by man-made interventions and pollution. As a result the lagoon and its inhabitants are facing deprived water conditions, causing not only health risks but also severely affecting the lagoon’s ecology. 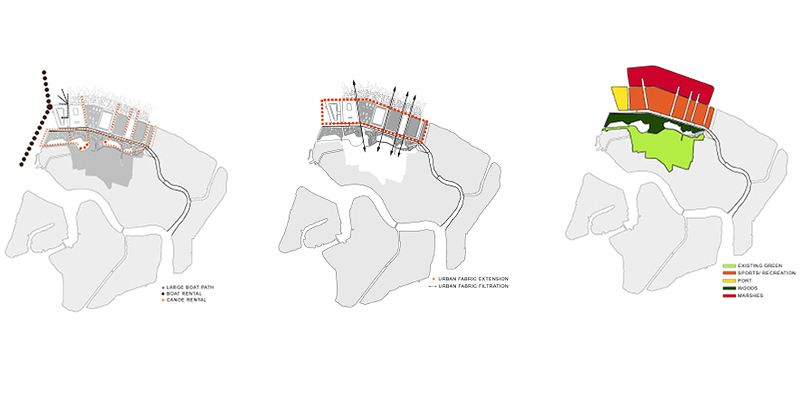 Our proposal suggests interventions which attempt to purify the lagoon using the shifting tides while simultaneously allowing for public interaction within a previously unoccupied waste zone.